BRITAIN’S CHRIS FROOME won his third Tour de France on Sunday to confirm his status as one of the all-time greats on the world’s most gruelling race. Froome finished with an almost three-minute advantage over Frenchman Romain Bardet with Nairo Quintana, the runner-up in 2013 and 2015, third. “It’s an absolutely amazing feeling. It feels like a privilege to be in this positon,” said Froome, who praised his Sky team-mates for their support after a day which saw German Andre Greipel win the final stage on Paris’ Champs Elysees. Froome won two stages during the race, taking his personal haul to seven in what was his most dominant performance yet. Having finished just over a minute ahead of Quintana last year, 31-year-old Froome was expected to face his toughest challenge yet as the course was meant to favour the 26-year-old Colombian. Froome himself described it as “a climber’s Tour” but the man widely lauded as the best climber in the world and expected to push him to his limits, frustrated with his timidity. Quintana claimed he was suffering from an allergy but his baffling contentment at finishing third — his worst Tour finish — spoke volumes. The loss of Alberto Contador, who crashed on the opening two stages and then succumbed to illness on the ninth, robbed the race of one of its chief animators. It was a coming of age for Bardet, who won a stage for the second year in a row and demonstrated impressive progression after finishing sixth in 2014 and ninth last year. Adam Yates was also a revelation as the 23-year-old Briton came fourth and won the young rider’s white jersey competition. It was a great Tour for the British as a whole, with Mark Cavendish winning four stages, more than anyone else, as he re-established himself as the world’s best sprinter after three years of being shoved into the shadows by burly German pair Marcel Kittel and Andre Greipel. Cavendish, the Manx Missile, is now second on the overall stage win list with 30, behind only Eddy Merckx on 34, the five-time Tour winner and Belgian legend still top of the pile. Britain won a third of the Tour stages, seven in total, with Stephen Cummings claiming a stage for he second year in a row. For British team Sky, it was a fourth Tour win in five years — an amazing achievement for a team created in 2010, and for a country tha had never had a Tour champion before Bradley Wiggins in 2012. It might have been Froome’s Tour but Peter Sagan was also a shining light. The world champion won three stages, claimed the green points jersey for the fifth year in a row and was also named the race’s most combative rider. The 26-year-old Slovak, who won his first ‘Monument’ one day classic race in April at the Tour of Flanders, is getting stronger all the time. He’s not a climber but the general feeling is that if he decided to lose weight and dedicate himself to Grand Tours, he would probably win this race one day. Rafal Majka of Poland won the king of the mountains jersey for the second time in three years but his only competition came from Belgian Thomas De Gendt, who is not even a climber. The Tour finished with a record 175 riders reaching the line in Paris while Australia’s Chloe Hosking won the women’s 89km one-day race around Paris that preceded the arrival of the men’s peloton. It was also a Tour that was remarkable, if not for the racing, a couple of memorable moments. The first saw Yates knocked off his bike by an inflatable arch 1km from the finish of the seventh stage. The other was the sight of Froome running to the finishing line on the iconic Mont Ventoux after his bike was broken in a crash with a motorcycle. Meanwhile, Ireland’s Dan Martin finished ninth overall, after coming 25th in this afternoon’s climactic race. It was a good day too for Martin’s fellow Irish cyclist Sam Bennett, who finished ninth in today’s final stage. 1. Chris Froome (GBR/Sky) 89 hrs 4 mins 48 secs. 2. Romain Bardet (FRA/ALM) at 4:05. 3. Nairo Quintana (COL/MOV) 4:21. 4. Adam Yates (GBR/ORI) 4:42. 5. Richie Porte (AUS/BMC) 5:17. 6. Alejandro Valverde (ESP/MOV) 6:16. 7. Joaquin Rodriguez (ESP/KAT) 6:58. 8. Louis Meintjies (RSA/LAM) 6:58. 9. Daniel Martin (IRL/ETI) 7:04. 10. Roman Kreuziger (CZE/TIN) 7:11. 11. Bauke Mollema (NED/TRE) 13:13. 12. Sergio Henao (COL/SKY) 18:51. 13. Fabio Aru (ITA/AST) 19:20. 14. Sebastien Reichenbach (SWI/FDJ) 24:59. 15. Geraint Thomas (GBR/SKY) 28:31. 16. Pierre Rolland (FRA/CAN) 30:42. 17. Mikel Nieve (ESP/SKY) 38:30. 18. Stef Clement (NED/IAM) 38:57. 19. Jarlinson Pantano (COL/IAM) 38:59. 20. Alexis Vuillermoz (FRA/ALM) 42:28. 21. Emanuel Buchmann (GER/BOA) 47:40. 22. Damiano Caruso (ITA/BMC) 48:23. 23. Warren Barguil (FRA/GIA) 52:14. 24. Haimar Zubeldia (ESP/TRE) 53:06. 25. Ilnur Zakarin (RUS/KAT) 56:33. 26. Tanel Kangert (EST/AST) 1h03:59. 27. Rafal Majka (POL/TIN) 1h04:25. 28. Wout Poels (NED/SKY) 1h06:57. 29. Tejay Van Garderen (USA/BMC) 1h12:06. 30. Vincenzo Nibali (ITA/AST) 1h19:59. 31. Daniel Moreno (ESP/MOV) 1h21:00. 32. Wilco Kelderman (NED/LNL) 1h24:38. 33. Domenico Pozzovivo (ITA/ALM) 1h25:14. 34. Frank Schleck (LUX/TRE) 1h27:39. 35. Mikel Landa (ESP/SKY) 1h32:19. 36. Steve Morabito (SWI/FDJ) 1h38:30. 37. Diego Rosa (ITA/AST) 1h46:36. 38. Daryl Impey (RSA/ORI) 1h50:51. 39. Bartosz Huzarski (POL/BOA) 1h55:28. 40. Thomas De Gendt (BEL/LOT) 1h58:45. 41. Julian Alaphilippe (FRA/ETI) 2h00:09. 42. Serge Pauwels (BEL/DDT) 2h00:38. 43. Sylvain Chavanel (FRA/DEN) 2h02:53. 44. Greg Van Avermaet (BEL/BMC) 2h06:13. 45. Amaël Moinard (FRA/BMC) 2h06:36. 46. Peter Stetina (USA/TRE) 2h07:22. 47. Jon Izagirre (ESP/MOV) 2h09:49. 48. Luis Leon Sanchez (ESP/AST) 2h10:25. 49. Rui Costa (POR/LAM) 2h11:42. 50. Jan Bakelants (BEL/ALM) 2h13:47. 51. Kristijan Durasek (CRO/LAM) 2h15:16. 52. Jakob Diemer Fuglsang (DEN/AST) 2h17:16. 53. George Bennett (NZL/LNL) 2h18:05. 54. Jan Polanc (SLO/LAM) 2h18:24. 55. Luis Angel Mate (ESP/COF) 2h21:17. 56. Georg Preidler (AUT/GIA) 2h25:45. 57. Mickael Cherel (FRA/ALM) 2h27:45. 58. Robert Kiserlovski (CRO/TIN) 2h28:06. 59. Eduardo Sepulveda (ARG/FVC) 2h28:27. 60. Fabrice Jeandesboz (FRA/DEN) 2h39:17. 61. Ben Gastauer (LUX/ALM) 2h41:05. 62. Alexey Lutsenko (KAZ/AST) 2h41:52. 63. Anthony Roux (FRA/FDJ) 2h43:51. 64. Martin Elmiger (SWI/IAM) 2h44:01. 65. Patrick Konrad (AUT/BOA) 2h46:32. 66. Simon Geschke (GER/GIA) 2h47:32. 67. Alberto Losada (ESP/KAT) 2h48:02. 68. Cyril Gautier (FRA/ALM) 2h49:49. 69. Winner Anacona (COL/MOV) 2h50:23. 70. Brice Feillu (FRA/FVC) 2h50:49. 71. Tony Gallopin (FRA/LOT) 2h51:23. 72. Ruben Plaza (ESP/ORI) 2h53:10. 73. Laurens ten Dam (NED/GIA) 2h53:22. 74. Paolo Tiralongo (ITA/AST) 2h58:12. 75. Jerome Coppel (FRA/IAM) 2h58:48. 76. Michael Schar (SWI/BMC) 3h00:54. 77. Michael Andersen (DEN/TIN) 3h01:22. 78. Arthur Vichot (FRA/FDJ) 3h02:10. 79. Thomas Voeckler (FRA/DEN) 3h02:35. 80. Nelson Oliveira (POR/MOV) 3h04:53. 81. Romain Sicard (FRA/DEN) 3h09:11. 82. Tom Slagter (NED/CAN) 3h09:19. 83. Oliver Naesen (BEL/IAM) 3h11:28. 84. Chris Anker Sorensen (DEN/FVC) 3h12:52. 85. Daniel Teklehaimanot (ERI/DDT) 3h14:07. 86. Andriy Grivko (UKR/AST) 3h14:31. 87. Arnold Jeannesson (FRA/COF) 3h18:14. 88. Jan Barta (CZE/BOA) 3h19:44. 89. Marcus Burghardt (GER/BMC) 3h20:22. 90. Anthony Delaplace (FRA/FVC) 3h21:09. 91. Tylan van Baarle (NED/CAN) 3h23:15. 92. Tsgabu Grmay (ETH/LAM) 3h23:17. 93. Pierre-Luc Perichon (FRA/FVC) 3h24:36. 94. Bertjan Lindeman (NED/LNL) 3h26:19. 95. Peter Sagan (SVK/TIN) 3h27:09. 96. Jeremy Roy (FRA/FDJ) 3h27:15. 97. Reto Hollenstein (SWI/IAM) 3h28:33. 98. Paul Martens (GER/LNL) 3h33:29. 99. Jasper Stuyven (BEL/TRE) 3h33:29. 100. Adam Hansen (AUS/LOT) 3h34:26. 101. Paul Voss (GER/BOA) 3h36:25. 102. Luka Pibernik (SLO/LAM) 3h38:17. 103. Vasil Kiryienka (BLR/SKY) 3h38:41. 104. Sep Vanmarcke (BEL/LNL) 3h40:02. 105. Florian Vachon (FRA/FVC) 3h40:09. 106. Nicolas Edet (FRA/COF) 3h42:42. 107. Antoine Duchesne (CAN/DEN) 3h44:54. 108. Imanol Erviti (ESP/MOV) 3h46:42. 109. Edvald Boasson Hagen (NOR/DDT) 3h47:29. 110. Michael Matthews (AUS/ORI) 3h47:40. 111. Timo Roosen (NED/LNL) 3h50:43. 112. Luke Durbridge (AUS/ORI) 3h51:55. 113. Bryan Coquard (FRA/DEN) 3h51:57. 114. Julien Vermote (BEL/ETI) 3h52:50. 115. Reinardt Janse Van Rensburg (RSA/DDT) 3h56:30. 116. Yukiya Arashiro (JPN/LAM) 3h57:06. 117. Brent Bookwalter (USA/BMC) 3h57:49. 118. Petr Vakoc (CZE/ETI) 3h57:58. 119. Christopher Juul-Jensen (DEN/ORI) 3h58:10. 120. Markel Irizar (ESP/TRE) 3h58:17. 121. Jerome Cousin (FRA/COF) 3h58:36. 122. Roy Curvers (NED/GIA) 4h03:16. 123. Gregory Rast (SWI/TRE) 4h03:44. 124. Lawson Craddock (USA/CAN) 4h03:44. 125. Natnael Berhane (ERI/DDT) 4h04:27. 126. Jurgen Roelandts (BEL/LOT) 4h05:22. 127. William Bonnet (FRA/FDJ) 4h06:18. 128. Cesare Benedetti (ITA/BOA) 4h06:23. 129. Angel Vicioso (ESP/KAT) 4h08:07. 130. Samuel Dumoulin (FRA/ALM) 4h08:08. 131. Alex Howes (USA/CAN) 4h08:22. 132. Michael Albasini (SWI/ORI) 4h09:04. 133. Andre Greipel (GER/LOT) 4h09:07. 134. Ramunas Navardauskas (LTU/CAN) 4h09:40. 135. Matthew Hayman (AUS/ORI) 4h10:33. 136. Matteo Bono (ITA/LAM) 4h12:53. 137. Cyril Lemoine (FRA/COF) 4h13:49. 138. Maarten Wijnants (BEL/LNL) 4h16:53. 139. Iljo Keisse (BEL/ETI) 4h16:57. 140. Stephen Cummings (GBR/DDT) 4h17:03. 141. Sondre Enger (NOR/IAM) 4h17:32. 142. Geoffrey Soupe (FRA/COF) 4h18:15. 143. Ramon Sinkeldam (NED/GIA) 4h21:41. 144. Maximiliano Richeze (ARG/ETI) 4h22:02. 145. Matteo Tosatto (ITA/TIN) 4h22:05. 146. Armindo Fonseca (FRA/FVC) 4h23:01. 147. Alexis Gougeard (FRA/ALM) 4h23:42. 148. John Degenkolb (GER/GIA) 4h24:24. 149. Alexander Kristoff (NOR/KAT) 4h24:24. 150. Fabio Sabatini (ITA/ETI) 4h26:39. 151. Luke Rowe (GBR/SKY) 4h27:49. 152. Kristjan Koren (SLO/CAN) 4h28:01. 153. Albert Timmer (NED/GIA) 4h28:11. 154. Andreas Schillinger (GER/BOA) 4h28:33. 155. Greg Henderson (NZL/LOT) 4h29:22. 156. Oscar Gatto (ITA/TIN) 4h29:38. 157. Christophe Laporte (FRA/COF) 4h29:47. 158. Yohann Gene (FRA/DEN) 4h30:02. 159. Maciej Bodnar (POL/TIN) 4h30:30. 160. Dylan Groenewegen (NED/LNL) 4h30:34. 161. Ian Stannard (GBR/SKY) 4h31:34. 162. Marco Haller (AUT/KAT) 4h31:40. 163. Robert Wagner (GER/LNL) 4h32:09. 164. Adrien Petit (FRA/DEN) 4h32:25. 165. Jacopo Guarnieri (ITA/KAT) 4h34:45. 166. Marcel Kittel (GER/ETI) 4h35:06. 167. Vegard Breen (NOR/FVC) 4h38:27. 168. Davide Cimolai (ITA/LAM) 4h39:37. 169. Marcel Sieberg (GER/LOT) 4h40:24. 170. Daniel McLay (GBR/FVC) 4h50:14. 171. Bernhard Eisel (AUT/DDT) 4h51:07. 172. Leigh Howard (AUS/IAM) 4h55:13. 173. Lars Ytting Bak (DEN/LOT) 5h01:18. 174. Sam Bennett (IRL/BOA) 5h17:14. 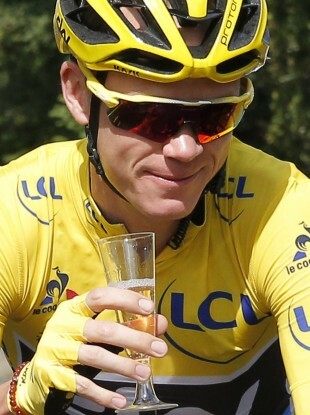 Email “Chris Froome wins third Tour de France, Ireland's Dan Martin finishes in top 10”. Feedback on “Chris Froome wins third Tour de France, Ireland's Dan Martin finishes in top 10”.